to assist you in all your trophy needs. 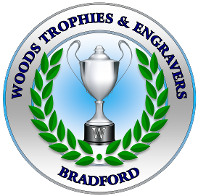 At Woods Trophies we sell Trophies, Medals, Personalised Gifts and more. 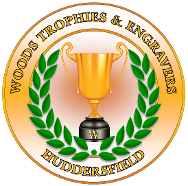 Please do come and visit us in either our Bradford or Huddersfield shop to discuss your requirements. See the trophies and feel their weight and quality before you make a purchase. Choose from a variety of engraving styles & fonts to make your award unique and special.